Every time I go in to an open body of water I am absolutely convinced there’s something lurking underneath. Sharks, killer bacteria, alligators, snakes, swamp thing… I know they’re all there, waiting for me to be dumb enough to enter the water. Yes, I know that Swamp Thing is a made up thing, but you can’t convince me of that while I’m in the water. 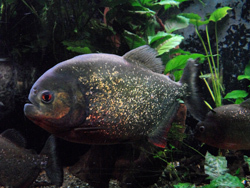 Stories like this, about piranhas attacking people in water where there aren’t supposed to be any piranhas… well, that’s just not going to help.